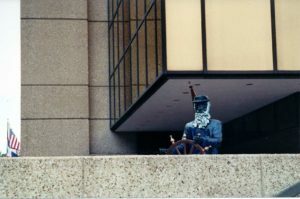 Circa 2001 or 02, St. Louis and its greater metropolitan area joined a number of cities in a populating their streets with art works based on various animals. 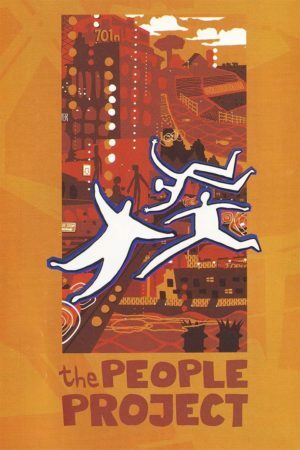 Chicago used cows, LA might have used turtles or something, but St. Louis decided on people. Known as the St. Louis People Project, artists submitted themed proposals and a committee of the sponsoring area awarded the commission. I submitted 2: Androids Built the Arch which featured a robot sitting restfully under the St. Louis Arch and was designed to imply the large scale of the robot. I knew this may not be a popular idea, but I like the alliteration for the title. A sculpture full of firsts: Commission, Public Work, Vandalization(s), Interview, Independent Group Show. My other idea was based on the suburban city of St. Charles theme ‘Old Man River’. The city is situated west of the Missouri River, right on the banks and was not only the former state capital, but also a major river port up until the earl 20th century. I submitted my proposal and was promptly accepted. Having gone to and lived in the larger St. Charles County most of my life, as well as early fresh out of one of the best Art/Design schools in the nation (if not world? ), it was a very proud moment for me. It was also my first commission. Naturally, having some theater background, the Old Man River song kept rolling through my head the entire project. It served as good inspiration. When the artist received the commission, the artist also received a decent sum. The amount, for me, paid to cover a lot of expenses even outside the project itself. We also received a large scale wooden mannequin, like that of a traditional posable drawing doll, to be mounted to a square board, then mounted itself to concrete. 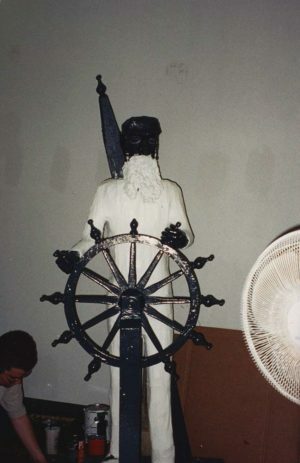 My statue, as proposed, was to have an abstracted stoic, bearded man at the great helm of a ship. Instead of standing on he deck of a ship, however his wetted, amorphous shoes stood in shallow water. The soles of his shoes creating currents in the water. 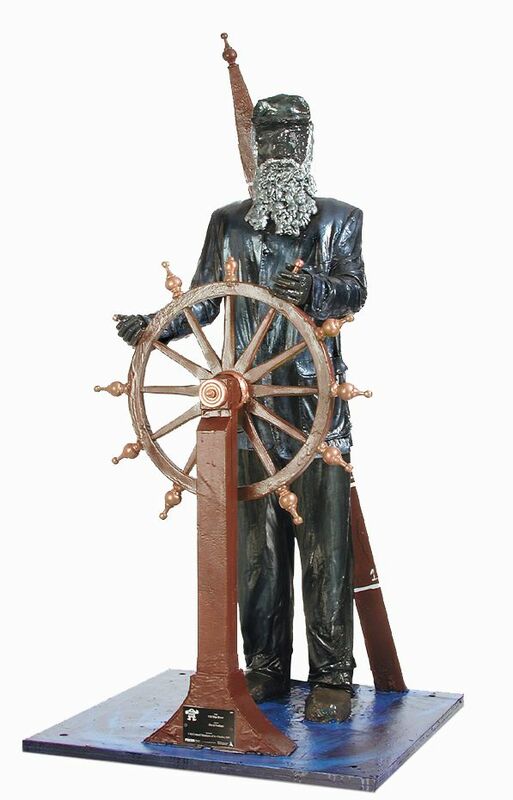 Behind him was a ship’s river depth gauge which called to the phrase ‘Mark Twain!’ Outside of being a pen name, this is an actual old term meaning the river bed was only 2 fathoms (about 12 feet) deep. It is the safe depth on the Mississippi (and probably Missouri, too) river for a steamboat. As the commissioned artist, we had carte blanche to achieve our idea. 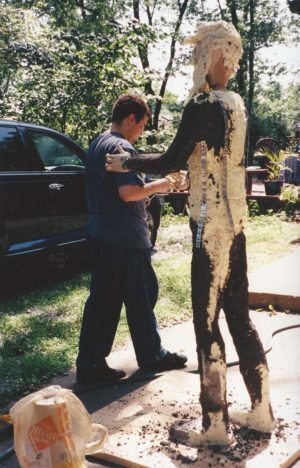 We had to figure on extra weight and thickness because all statues eventually received covered in an industrial strength polymer coating akin to durable truck bed liner materials. Basically, I built up the bulk of the statue to anatomically sculpt it with Great Stuff foam insulation. After that, I cut apart cheap, older shirt store sourced clothing and dressed him. I used a thinned lacquered to give the clothing a stiffness before it received it’s final coating. The beard comprised an unaltered use of the expanding foam insulation and silver paint. The whole piece, after the required coating, received various slightly iridescent coatings (this was then coated in a required clear lacquer). The help and depth gauge were decorative and standard grade lumber pieces. 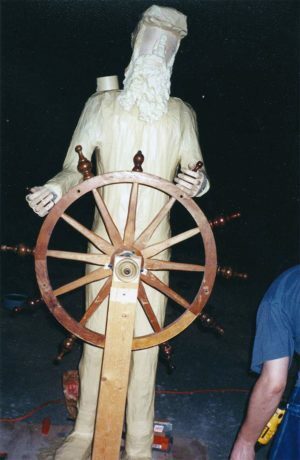 The helm being a old wagon wheel with furniture finials as handles. Each was covered in copper or bronze faux finish. 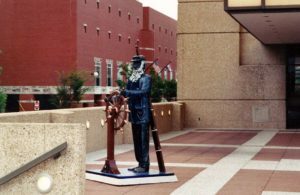 The whole piece was well received by the mayor and city council at the time and sat in a place of glory outside of St. Charles City Hall. It was even visited by members of St. Charles sister city in Ludwigsburg, Germany and featured in their small town paper. I forgot there’s even a light layer of concrete. 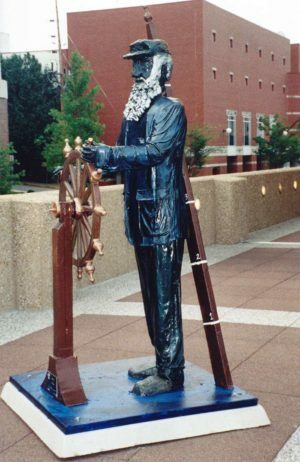 Once in 2005 or so, the city contacted me and informed me that overnight someone vandalized my statue by breaking off some fingers. I tracked down some suitable replacements, and eventually got those repaired. Perhaps about 5 years later, maybe, I received word from the City of St. Charles again of vandalism, but this time vandals went too far. Torn from its base at the ankles, the figure lay near its former base. The helm ripped from the base and perhaps stolen. This shocked me and I grew annoyed to no end, but at this point I travelled enough psychological distance from the piece that it didn’t affect me much. As recompense, the city gave me any remaining fragments back. Due to the damage and strangeness of the event (the people project right next to mine by another artist went undamaged or even touched), I landed an interview by a local paper. It was an interesting affair all told, but it kind of left me proud. This had been my first commission ever, my first public art piece, and now my first of having something publicly vandalized. I felt I weirdly ‘made it’ as an artist since the piece received such dramatic damage. I have theories of why it occurred. 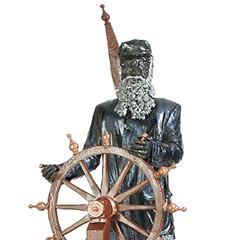 My primary theory: the helm, uniquely rendered with a copper faux finish, that someone–inebriated or otherwise–actually mistook it for copper and made off with it. Copper had a high price at the time. Houses–old or under construction even–in and around St. Louis were notoriously looted of their copper pipes and such.